It was in May last year when I finally made the down payment for my new home, and I was allowed to move in immediately. What a beautiful feeling! I was done with monthly rental payments. However, there is this one thing that I hadn’t figured out — there would no longer be a landlord to worry about simple repairs around the house. I was solely responsible for my lawn, leaking sewer lines, dirty gutters, and any dysfunctional lighting fixtures. Dealing with small issues in my home has given me a lot of experience with household DIY projects. And as a result, I’ve learned how important certain tools are in our homes. If you’re a first-time homeowner, be ready to face some similar projects that will require the use of several different tools. 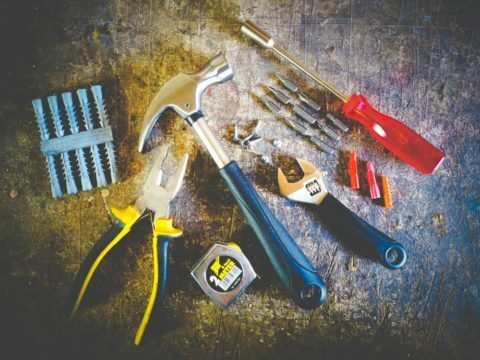 To help you prepare properly for any DIY home project you may come across, I’ve put together a list of tools that every homeowner should own. My first tasks in my new home were to assemble furniture and screw in lamp casings, among other things. It would have been impossible without having different screwdrivers on hand. My screwdriver set has come in handy when fixing various items in my house, so far. Even a 4-in-1 set with screwdrivers of different heads and sizes will be helpful. The Phillips head (x-shape) and flathead screwdrivers are the 2 that you’ll use the most. You can also opt for an all-in-one screwdriver — with a handle that accommodates different tips. That one tool will work with a variety of screw sizes and types. Slip-joint pliers will come in handy when you want to hold things tight, pull out something like a nail, or bend metal. Think of a task like loosening a tight nut on your furniture. Some bolts turn as you unscrew the nut, making it hard to accomplish the task. But holding it in place with pliers while you remove the nut will make your work easier. Tightening or loosening nuts and bolts with a pair of pliers can be a slippery exercise — especially when the sizes involved are larger than the pliers can grip. With an adjustable crescent wrench, you adjust the size of the opening so it fits the bolt or hexagonal nut you want to grip. This tool can handle almost any size of bolt/nut you may want to tighten or loosen in your new home. I found this tool very useful when I wanted to partition my son’s closet — so he could have a separate space for his toys. Pounding the nails in, tapping to straighten them, and pulling out the crooked ones were tasks that only a good old-fashioned claw hammer could accomplish. Note that there are different types of hammers in the market today. The choice depends on the kind of tasks you plan to carry out with the hammer. For DIY projects that you are likely to do at home, a claw hammer will be enough. Make sure you choose a lightweight design with a strong head and firm handle. You will surely want to reach high points of your house at some point. For example, when hanging picture frames, fixing lighting bulbs, cleaning gutters, or painting the top areas of a wall. A ladder is one item you cannot do without as a homeowner. This is a helpful tool that you are going to need for numerous home projects. You’ll use it when drilling holes on hard surfaces — such as walls and metals. You can even use it as a powered screwdriver — just insert a flat or Phillips head screwdriver tip, and you’ll get the job done much more quickly than you would if done manually. 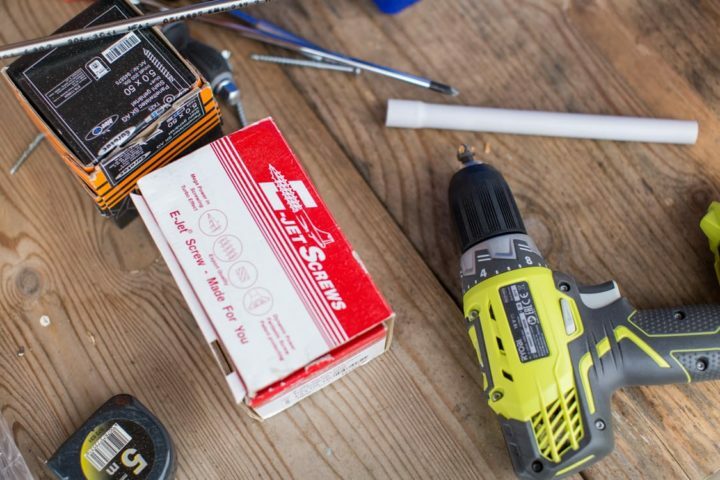 One advantage of choosing a cordless drill is that you will not need to carry around long electricity cables to power your drill when working outside or far away from an outlet. Your compound is the first area any visitors to your home will notice — which makes it crucial to keep the lawn beautiful always. This can only be possible when you have the right tools at your disposal. You’ll want to invest in a lawn mower for keeping the grass short, a garden hose for watering, a shovel for digging, a rake for spreading soil or collecting yard debris, and a few other gardening tools — depending on your outdoor landscape. Certain things — like safety goggles, work gloves, and an apron — will be used more than others. You don’t want to allow your skin or nice clothes to come in contact with dirt, glue, paint, etc. With some home projects, you’ll be handling dangerous tools or chemicals — so make sure to wear some protective gear while you’re working. Some of the tasks I’ve accomplished with the above tools are very simple. It wouldn’t make sense to hire another person to do them. However, without the right tools, I wouldn’t have been able to accomplish much. You don’t want to be borrowing from neighbors all the time. So, which were your first DIY projects in your new home? Which tools did you find most valuable for those projects? David Kato is a DIY enthusiast who is always looking for something to fix and create around the house. His passion for DIY and home improvement has allowed him to try out a lot of different power tools. He shares his reviews and guides on TheToolGuides.com.